Building on the Oxford AQA GCSE Religious Studies Student Books, this Revision Guide for Christianity and Buddhism offers a structured approach to revising the new 9-1 exams. With all essential content condensed and made memorable, and plenty of exam practice, tips and annotated sample answers, students can confidently prepare for their new exams. AQA GCSE Religious Studies A: Christianity and Buddhism Revision Guide by Marianne Fleming was published by Oxford University Press in January 2018 and is our 10571st best seller. The ISBN for AQA GCSE Religious Studies A: Christianity and Buddhism Revision Guide is 9780198422853. 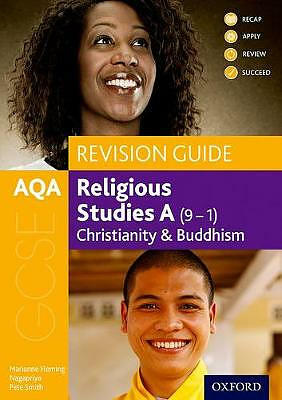 Be the first to review AQA GCSE Religious Studies A: Christianity and Buddhism Revision Guide! Got a question? No problem! Just click here to ask us about AQA GCSE Religious Studies A: Christianity and Buddhism Revision Guide.